Acquiring a booth and showcasing your products and services is fun, easy, effective and rewarding. You can network with colleagues and build strong relationships with those who need your products and services. Make sure to have a presence at the next California CUPA Forum Training Conference to find the people who influence "buy" decisions. Generate leads, build your brand awareness, and showcase your expertise with our audience of decision-makers. 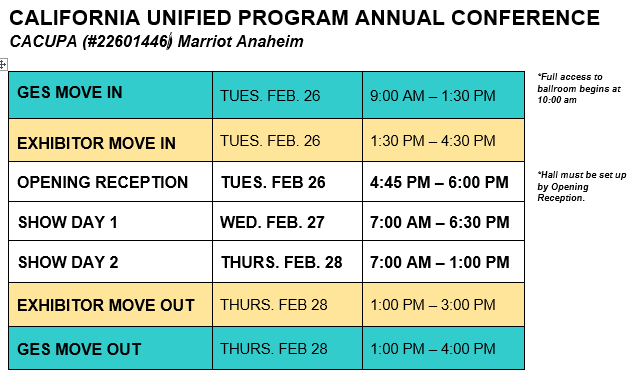 To acquire a booth at the next California CUPA Forum training conference, pay EXHIBITOR fees online, or, download the Exhibitor registration form, fill it out, and email or fax with your payment. Browse products and services offered by our exhibitors, gather a wealth of information to help you and your organization make smart decisions, and save time and money.